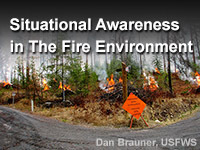 Maintaining situational awareness is a crucial skill in every decision-support situation. Wildland fires that threaten populated areas have the potential to inflict devastating damage to communities and can also threaten the personnel working on the fire. This lesson introduces the Situational Awareness Cycle. Learners practice using it to continuously monitor and adapt their support strategies and decision-support information depending on the rapidly evolving wildfire conditions. The lesson also discusses a range of tools that can be used to build and maintain situational awareness. Situational awareness is a hard topic for any field. This lesson did a great job of applying it to Fire weather forecasting. The quiz is no pushover and made me think. Of the lesson's I've done, this was the least helpful. The quiz scores and terminology was never fully explained. I fell like I wasted a lot of time and not passing the course I didn't even feel like I could improve by reviewing it all again because of the vague answers. Wish I read these review beforehand. This quiz was extremely frustrating since the questions with multiple choices could have gone either way. Details were never specifically explained in the lesson. Some of the main concepts of the conceptual model were hard to follow. The quiz brought up questions that did not seemed to be answered well in the lesson. After I went through the lesson, I still felt like I did not fully understand what a conceptual model was and how the monitoring and inputs played into it. The material was very useful. However, I found the presentation to be confusing. To start units out with a quiz, and then not fully explain the answers to the quiz, was frustrating. I went back over the material, and the best I could do was about 80% on the final. I realize that a lot of the selection of inputs is time and incident driven, but there was not a lot of clear notes on what sort of input is good for what sort of situation. For a guy like me who is trying to get up to speed in time for what looks like a busy fall, it was frustrating to have to feel like I was deciphering a code. The class needs work. There is no way to determine how to improve after quiz when you don't know what you got correct the first time. At least highlight the correct answers after the quiz. Some of the answers could have overlapped into other categories. One of the worst lessons I have participated in. Answers are quite gray. There are really no black/white or yes/no answers in real-life. It's good that it appears partial credit is given to some answers. This was a very informative lesson with loads of valuable tools and resources! This lesson is specific to weather / fire behavior forecast staff. As a line fire fighter, we apply situational awareness using slightly different tools. I found some new tools worth bookmarking, to help stay current with the big picture. I found the lesson interesting and it helped me better understand some aspects of situation awareness with regards to wildfires. However, the language used appeared to be rather difficult in parts. As the science officer at a NWS office, I think this lesson will be a great addition to our Fire Weather training series of lessons for new personnel. The lesson is broad enough to apply to any region. I would like to see the input section to include spotter reports. Need quiet area to read and understand the complexity of the questions. The quiz for the module was updated in April 2019.